← What is the collective noun for entomologists? I think it must have been sitting at the edge of my consciousness. I regularly have a clear out of survey specimens. These are the sample voucher specimens collected, but once identified under the microscope, they go off to be used for whatever educational purpose I can throw them to. The last lot went to the Horniman Museum, some might have found their way into the behind-the-scenes reference collections, but most were for use at their hands-on nature base. 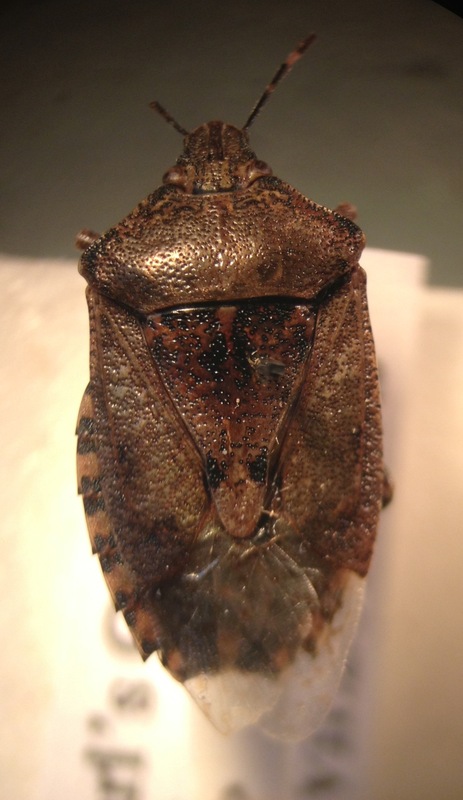 Last week, whilst sorting out some insects from past surveys, I noticed the largish shieldbug. It was unnamed. It looked odd. Dredging the depths of memory I vaguely recall thinking it looked a bit unusual when I swept it from the rough brownfield herbage between the railway lines and houses behind Earl’s Court Exhibition Centre in July 2012. At the time I glossed over it as possibly a large pale version of the common hairy shieldbug, Dolycoris baccarum. As usual, I did not have enough time to do anything more than merely set it aside to look at in the dim future. Now, however, pinned beside specimens of Dolycoris, it looked very different. Head and shoulders of Rhaphigaster nebulosa. Rhaphigaster nebulosa, not a great picture, but taken down the barrel of the microscope on my phone. Imagine, if you will, the sound of assorted gears and cogs grinding, light bulbs pinging on and pennies dropping. Oh! It’s that one. Rhaphigaster nebulosa, the mottled shieldbug, had been spreading through Europe for the last 20 years when it was first noticed in Rainham Marshes in September 2010. Penny Frith found a breeding colony in Warwick Gardens between Peckham and Camberwell, the following year. What’s really embarrassing is that I went with her to the site to try and find Orientus ishidae, another bug she’d discovered there new to Britain, and she told me all about Rhaphigaster at the time. Her pictures of it are spectacular. I just did not take it in. I’d better have another trawl through the last few years’ left-overs, to see what else I’ve missed. 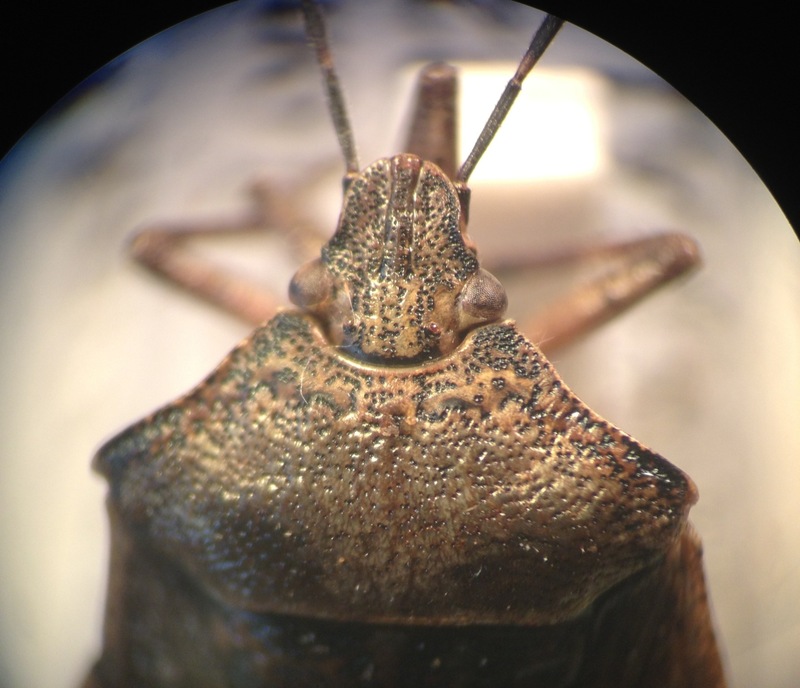 This entry was posted in Surveys and tagged Earl's Court Exhibition Centre, invertebrate surveys, mottled shieldbug, Orientus ishidae, Rhaphigaster nebulosa. Bookmark the permalink.